· The second captain ever to have lead an Indian team to a world cup victory (T20 world cup 2007). 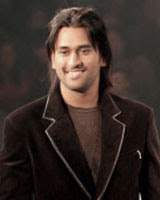 Padma Shri Mahendra Singh Dhoni is the current Indian captain for all versions of the game. He is better known for his flamboyant; aggressive; destructive batting and swift wicket keeping skills. Dhoni (MSD or Mahi or MS Dhoni) was born in Ranchi to Mr. Pan Singh and Mrs. Devika Devi Pan Singh. Initially excelled and has also represented the district level in badminton and football (as goal keeper), took cricket seriously from his 10th standard. After an impressive stint with commando cricket club was picked for vinod mankad under 16 trophy during 1998. He also played for Bihar u-19; Bihar state and India A team. Hi performances lead to his selection to the Indian ODI tour of Bangladesh during December 2004. His ODI Career started off with a duck in his first ODI match and had an average performance during his first series vs. Bangladesh but made his mark during his 5th ODI match scoring 148 off just 123 deliveries. This was the best ever by an Indian wicket keeper which went on erased later in the year when he scored 183 not out off just 145 balls with 10 sixer’s. This score of 183 not out erased various record set by an Indian batsman including the most number of 6’s in a match and also helped him move from “C” to a “B” grade contract with BCCI. His consistent performances from Jan to Apr’ 2006 made him the No. 1 in the ICC ODI Rankings for the first time. MSD made his Test Debut during December 2005 against Srilanka following his good ODI performance against the lankans. He made his maiden century against Pakistan early 2006. As captain, he soon reached heights that were earlier achieved by only a few. First took over the team for the inaugural ICC T20 championships during 2007 and came back victorious becoming only second Indian captain to have ever won a world cup for India. He then became the captain for the 7 match ODI series against Australia. During November 2008 followed by the retirement of Anil Kumble took over as captain for Test cricket version also. His aggressive batting and swift wicket keeping has certainly made him an remarkable personality in the Indian cricket team but his ability to lead the Indian cricket team; to be cool under pressure; to make smart decisions has won him the hearts of millions of Indian cricket fans and is fondly called as “Captain cool”. Endorsements always pile up for Indian cricketers and for somebody like Dhoni who came with a stylish long hair and scored so quick he immediately became the target of many endorsements. He currently has as much as 20 endorsements just next to Shahrukh khan.